We are procrastinators when it comes to completing home projects. So for September's resolution, we decided to make we checked a few projects off our to-do lists. I'm so happy with how it looks! 2. Finish wall art projects for our daughter J's big girl bedroom. The embroidery hoops and bulletin board have been completed. These were my favorite projects this month...and I think they look great! I can't wait to share pics of them with you soon! I loved the fabric I found at Hobby Lobby! Now, for the fails. I ran out of time to paint the mirror frames. Boo. And I didn't paint the IKEA spice racks - that we were going to use as bookshelves - because they just aren't going to fit in her room. This project has now moved to our son B's big boy room project list. And that is one of the next rooms to finish in our house! 3. Hang up all of the wall art in her bedroom. Okay, I failed a little here too because we haven't hung anything up. But I do have everything mapped out where it will go. And that's huge since I'm indecisive with these things. (So I'm counting this as more of a success than a fail. ;) Everything we be hung up in the next 2 weeks! 2. Instead of painting the entry, we finished the kids' bathroom. We did some art work, got a new faucet installed, and will put up the new towel holder (which I love!) once we have a hammer. ;) I'm so glad this room is finally done. We know we didn't finish every project on the list, but putting this on the blog sure motivated us to get at least some of them done. We did not want to come back in a month and say we didn't even finish one project! It made us go to Hobby Lobby (our fave craft store), get our supplies, and actually sit down and do the projects. For us, it wasn't that we didn't want to do the projects; it was just carving out the time to do them. We're so glad we did! It feels great to check some things off the to-do list and make our house feel more like a home! How did you do with your resolution this month? to better ourselves as wives, mothers, and women or to make our houses into homes. LOVE those fabric choices and can't wait to see your finished hoops on the wall! Love the dresser! I'm sure it will turn out amazing. 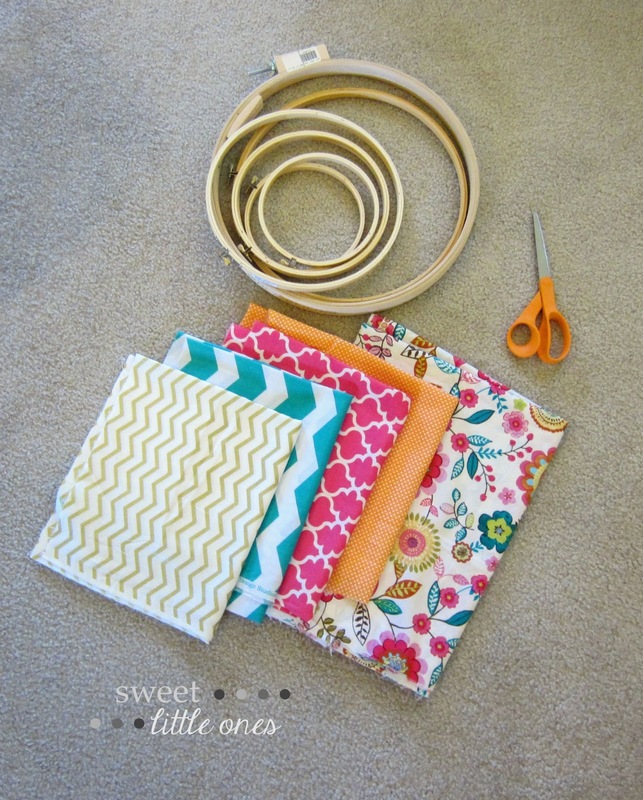 The fabric hoops for the big girl room are such a fun idea. I can't wait to see the finished products. The dresser is sooo precious! We have a tree on our daughter's wall! Beautiful fabric choices! I gotta say, I read y'alls profile and misread it as "sister wives". I thought, "now this is going to be interesting!" Cute blog. that dresser is awesome-- you are crzy talented!! Thank you so much for stopping by our blog. It's great to see other sister bloggers! Looking forward to reading more from you. 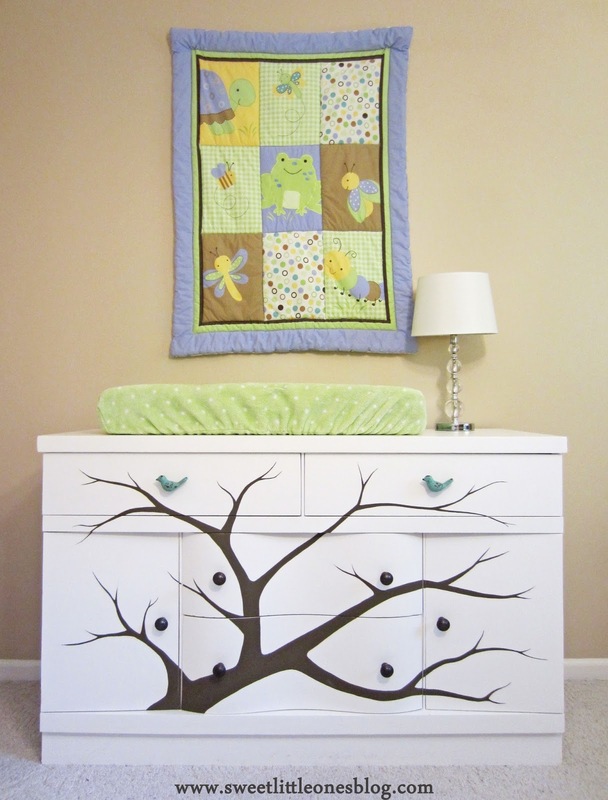 That dresser with the tree on it is so incredibly cool! Now you're making my hands itch to do a little crafty work!